← Learn how the Emergency Communication Hubs function! Reminder: OEM Training for Trainers class is tomorrow! Are you interested in training others about emergency preparedness? 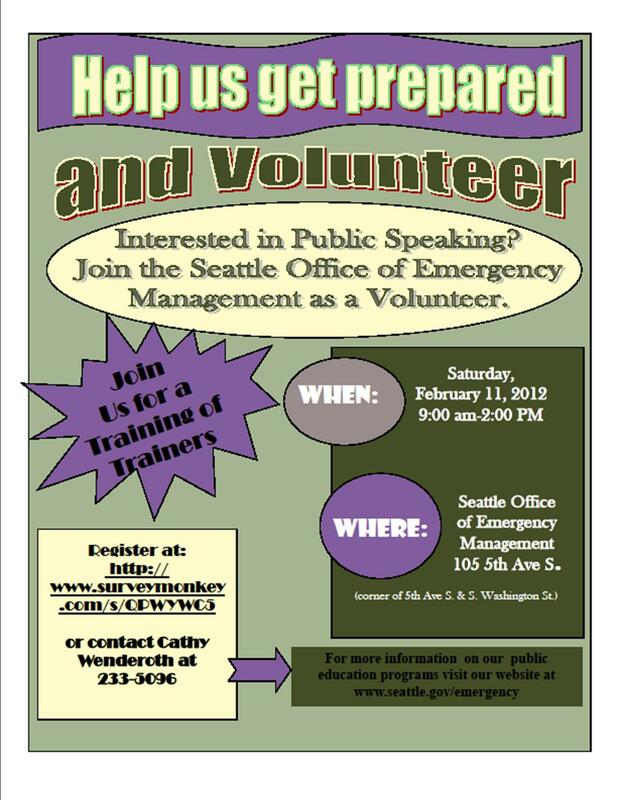 The Seattle Office of Emergency Management is offering this special session for those who would like to volunteer to train others. They especially encourage those who are interested in, or involved with, our emergency communication hubs to consider attending! To register or for more information, call Cathy Wenderoth at (206) 233-5096. The survey link mentioned in the flyer is now closed. The class is tomorrow, February 11th, from 9 AM until 2 PM at the Seattle Office of Emergency Management, 105 5th Ave S (on 5th, near S. Washington Street). This entry was posted in Announcements, Events and tagged Training for Trainers. Bookmark the permalink.